For the last month, our schedule has been impacted by my husband’s undergoing a 17.5-hour surgery for an hiatal hernia, hence the irregular postings to my blog as well as commenting on others. The surgery has also affected our daily menus with temporary restrictions on what my better half can safely consume. 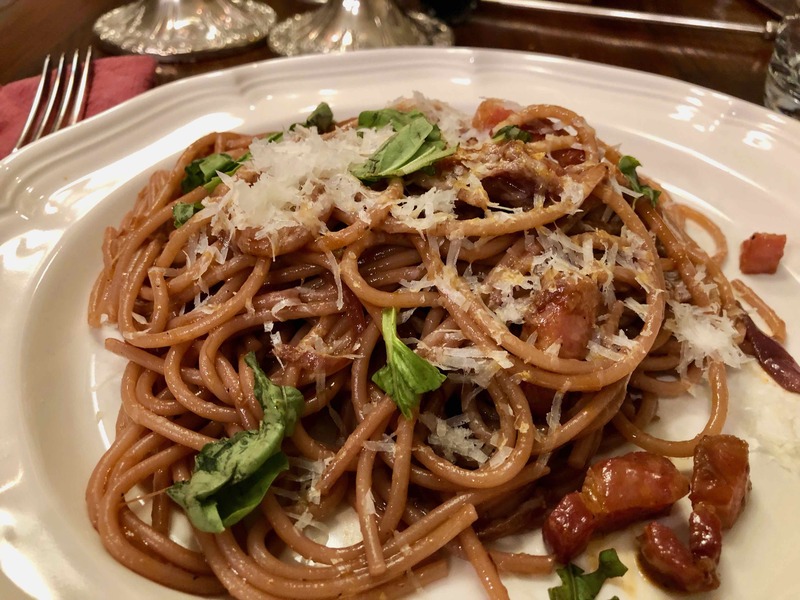 My brother recently sent me a link to a recipe in the New York Times for “drunken spaghetti,” or spaghetti all’ubriaco and suggested that I do a blog post about it. 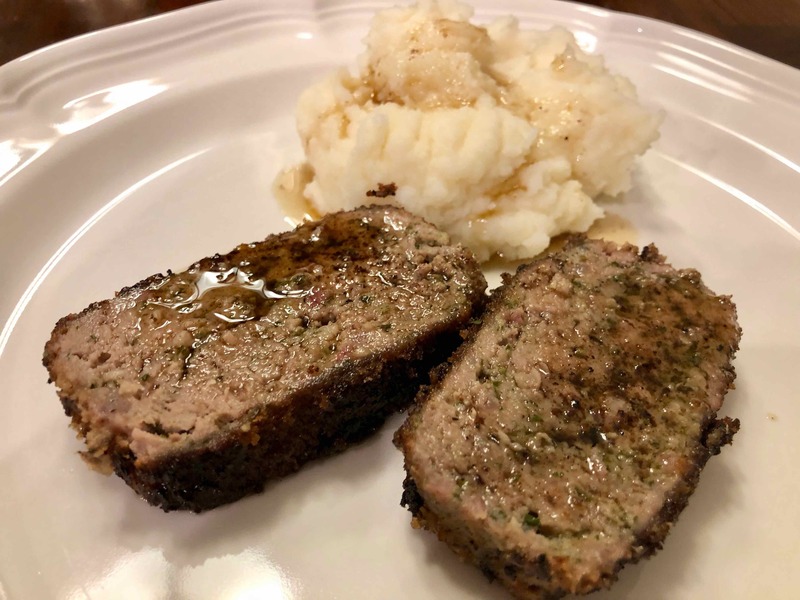 I’ve seen the dish prepared several times on television by celebrity cooks like Rachael Ray and, over the years, have read about it in the press. 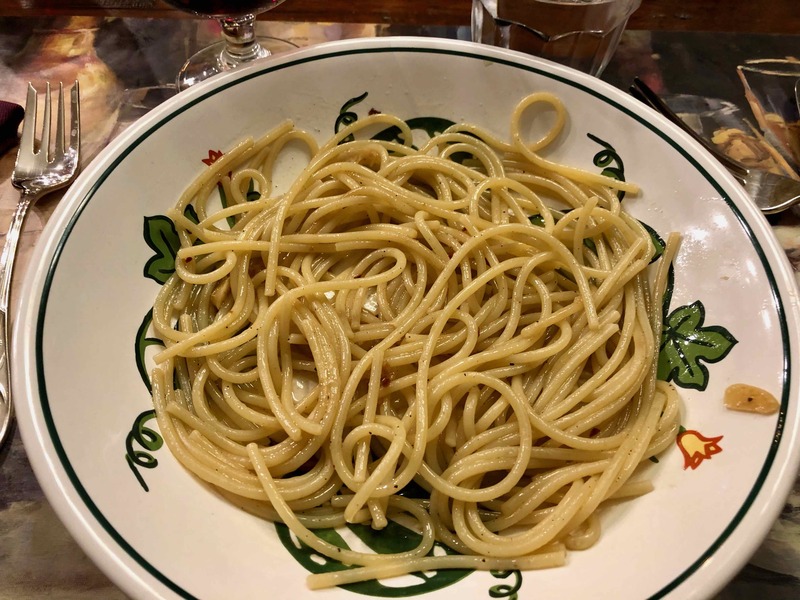 Recipes for it also abound on the internet, some posted by travelers who first encountered it in Tuscany, others by food writers like Mark Bittman, who wrote a column about it in 1998, after having enjoyed the dish at Osteria del Circo in New York City. I must admit that the dish, as well as its preparation, has a lot of wow factor, which makes for good television, especially when a celebrity chef dumps, with a flourish, an entire bottle of wine into a pot for cooking the spaghetti. As you might expect, some cooks go overboard and call for using status wines like Barolo or Rosso di Montalcino and the audience soaks it up with oohs and aahs. Indeed, all the razzle-dazzle associated with this dish may be the reason I’ve avoided making it until now. Today’s post is pretty much a repeat of one I did four years ago. It wasn’t until we sat down to supper that my husband asked if we hadn’t had this dish before. Well, I checked after dinner and, sure enough, he was right. There was, however, one major difference. 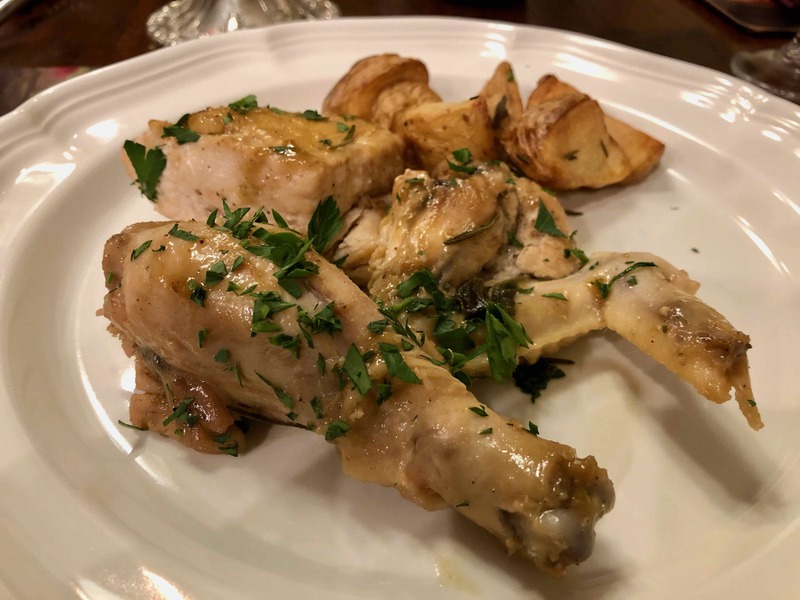 The first time I prepared the dish, I used chicken thighs; last night, I used a whole chicken cut into 10 pieces as suggested by the recipe. Although I attribute my passion for cooking to my Neapolitan aunt, who I used to observe closely whenever she prepared, solely from memory, one of the multitude of dishes in her repertoire, it was Marcella Hazan who really taught me how to cook classic Italian dishes. I remember how her first book, published in 1976, inspired me to try so many new dishes like baked semolina gnocchi, vitello tonnato, pork loin braised in milk, her unique ragu Bolognese, etc. etc. Over the years, I’ve collected almost all of her books and often refer to them either for new recipes or for cooking wisdom. It is the latter of these, sage advice, that makes up the greater part of her last book, Marcella Says, published almost 30 years after her first. 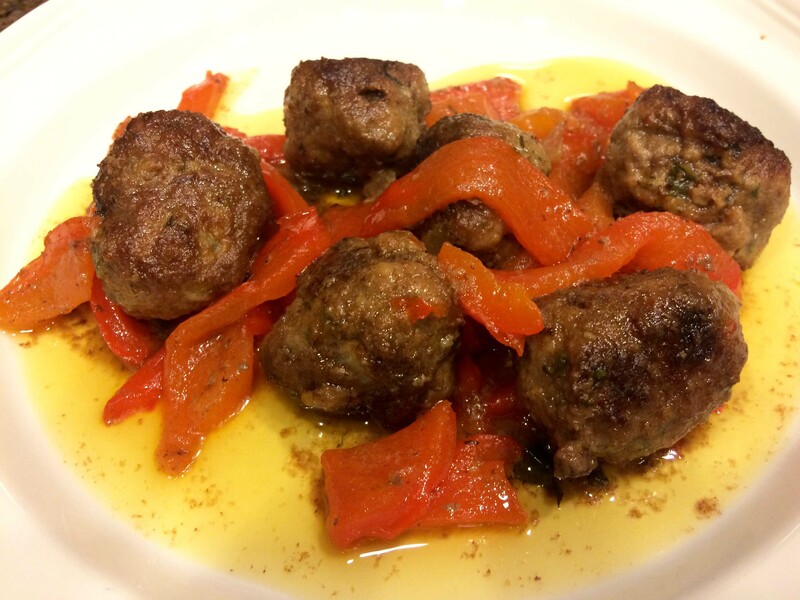 From that final collection, comes the recipe for today’s post, Polpettine di Manzo con i Peperoni, Spicy Beef Meatballs with Bell Peppers. 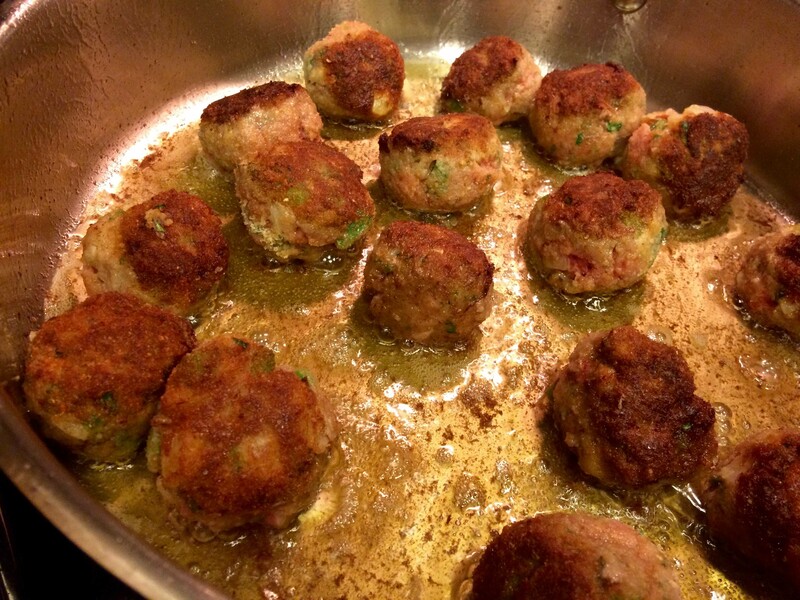 These are nothing like the spicy meatballs one may associate with the legendary Alka Seltzer commercial or with the Italian-American versions that are part of many a Sunday sauce. 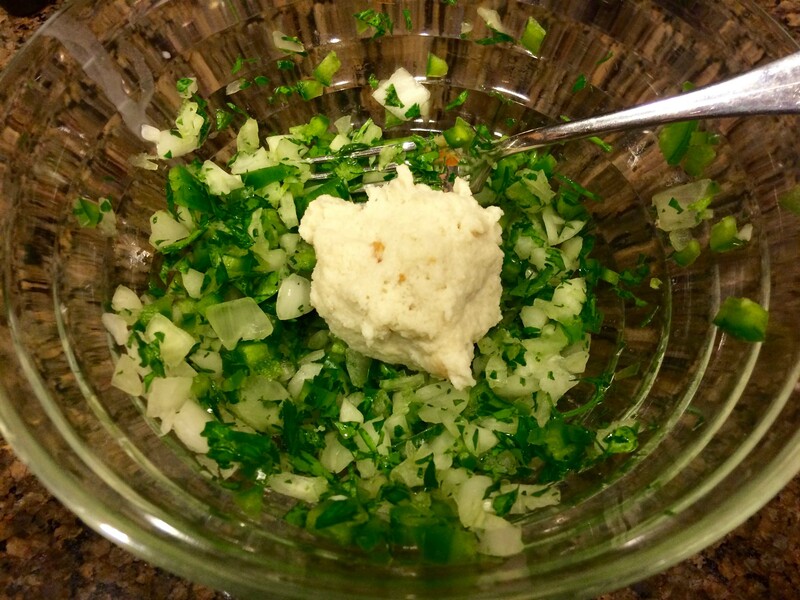 Rather, they are small and delicate bundles of meat, gently mixed with parsley, chopped onion, and jalapeño pepper, and bound with egg and a white-bread panade, made from torn white bread soaked in milk. Another difference is that there’s no tomato sauce. 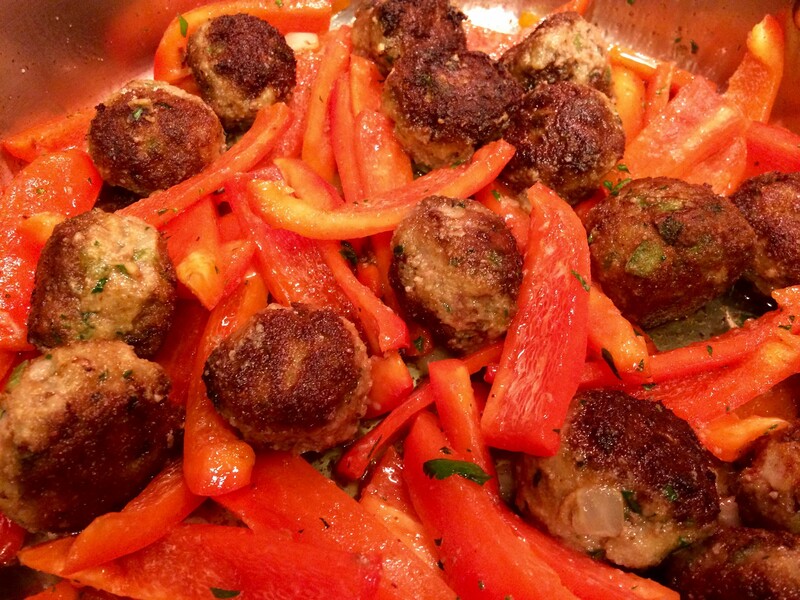 After frying, the meatballs are simmered along with a load of bell peppers, peeled and sliced. How long the peppers are cooked is up to you. If you like your peppers with some body, you can opt to cook them for as little as ten minutes. Or if, like me, you prefer a more tasty, succulent sauce, you can continue the simmer for about 30 minutes, or when the peppers just begin to dissolve. 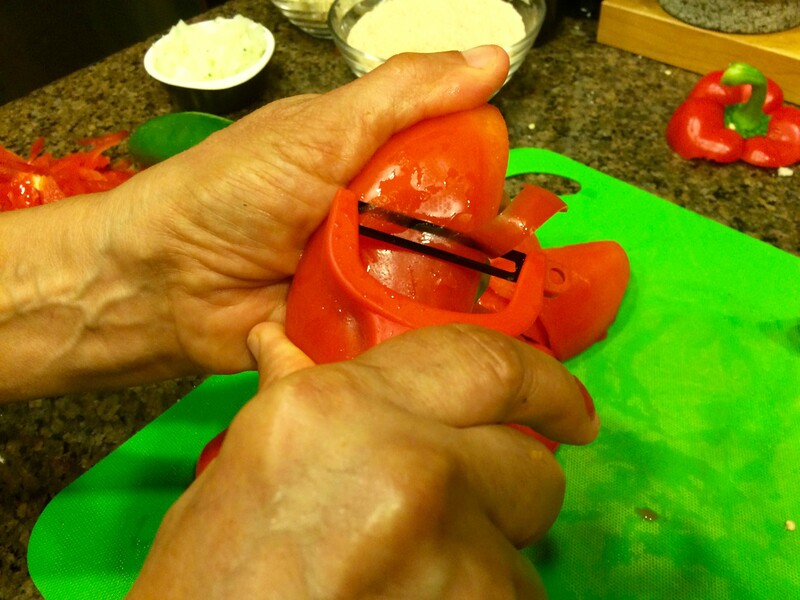 1 – Cut the bell pepper lengthwise along the creases, remove the stem, seeds, and pithy core, and skin them with a swivel-blade vegetable peeler. 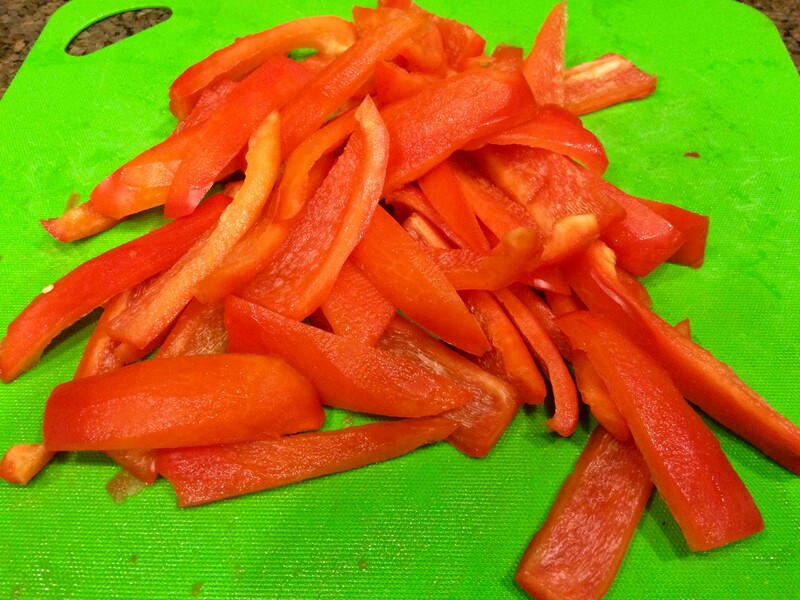 Cut the pepper into strips about 1/2 inch wide. 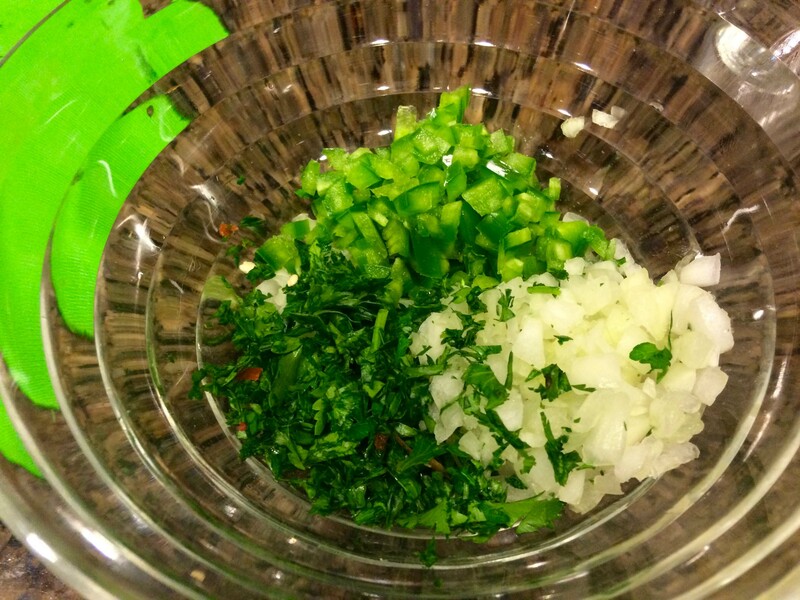 2 – Put the parsley, onion, and jalapeño pepper in a bowl and mix together well. 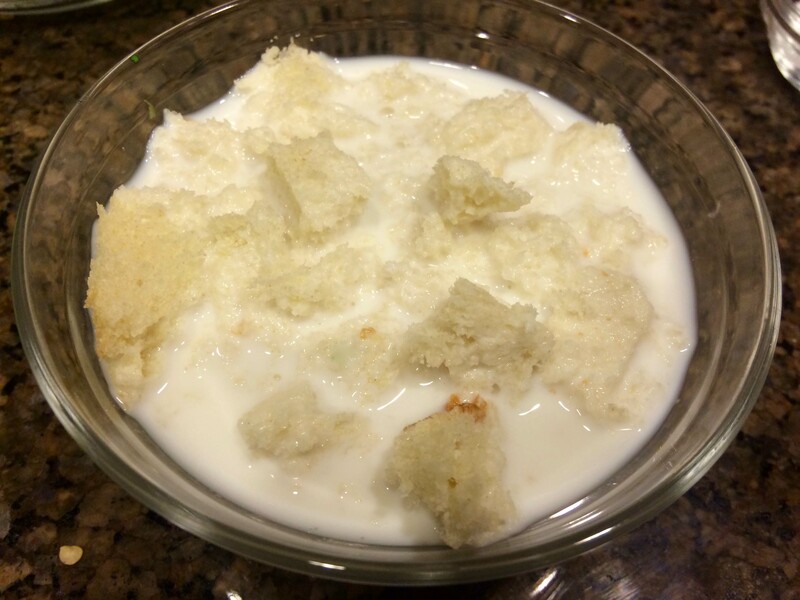 3 – In a small bowl soak the fresh bread crumb in the milk. 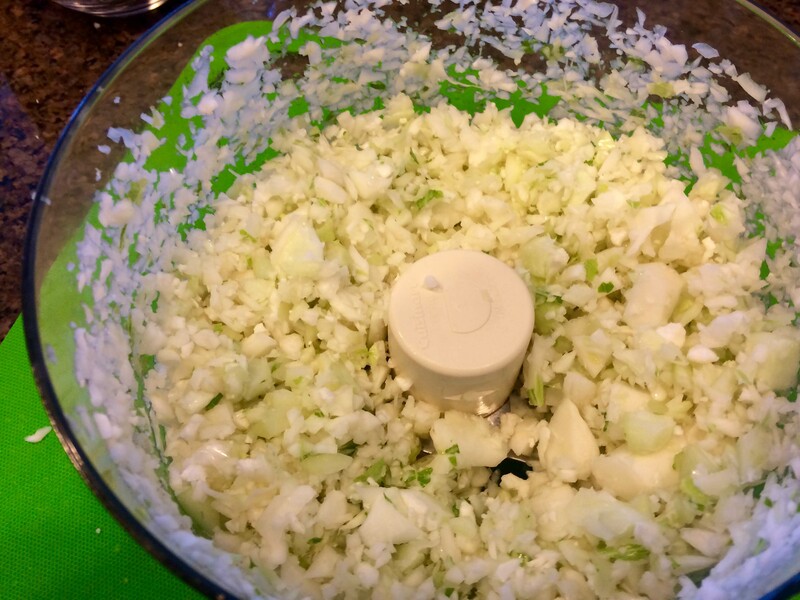 As soon as the bread is saturated with the milk, squeeze it out gently in your hand and add it to the onion mixture, working it until combined. 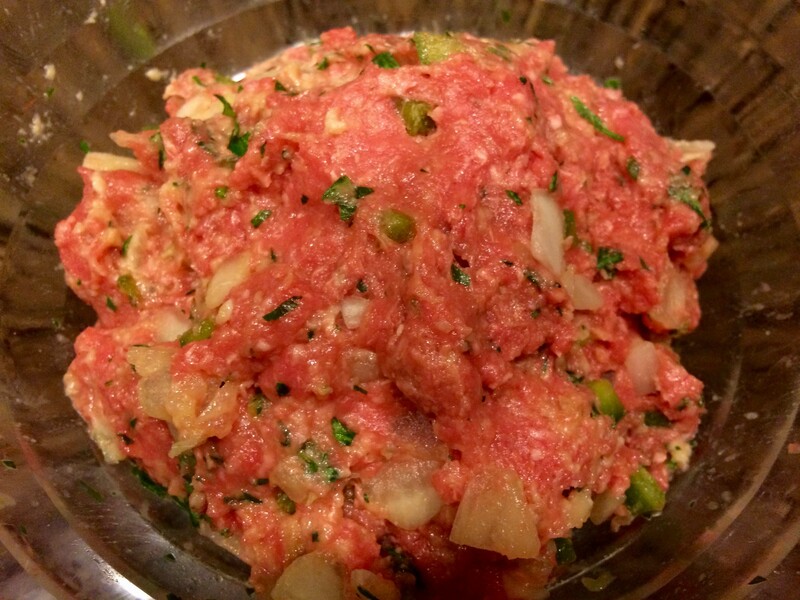 4 – Add the ground chuck, egg, and salt, kneading the mixture very gently with your hands. 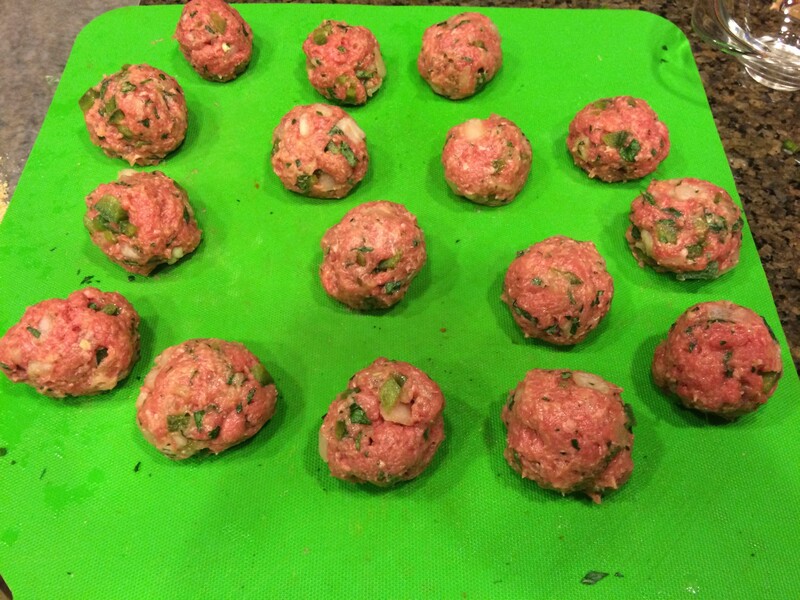 5 – Pull off a piece of the meatball mixture about the size of a very small egg and shape it in your hands into a ball, being careful not to squeeze it too hard. 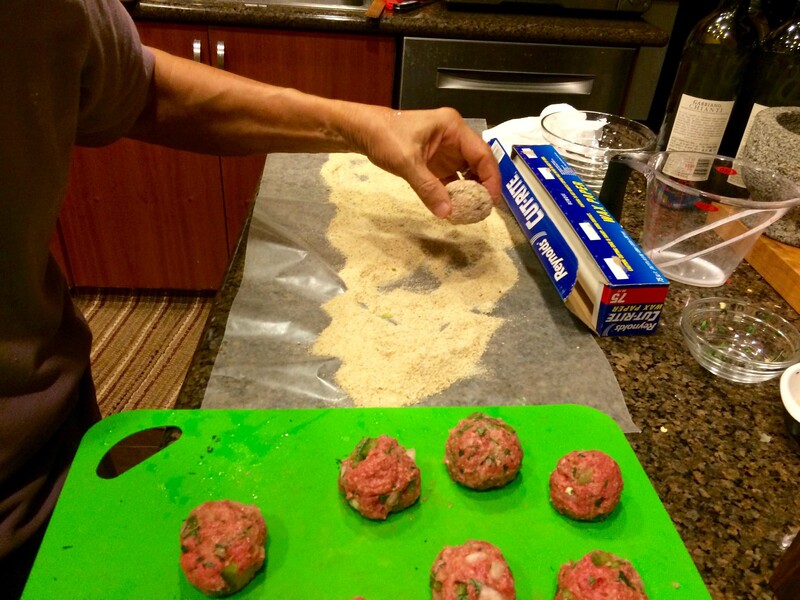 6 – Roll the meatball in the bread crumbs. 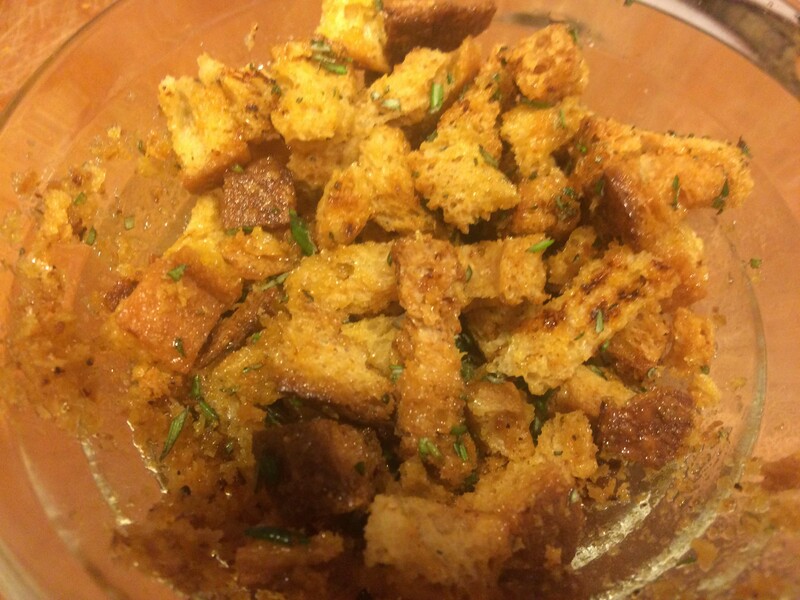 Pull off another piece of the meat mixture and repeat the procedure until you have used all of it and the balls have been rolled in bread crumbs. 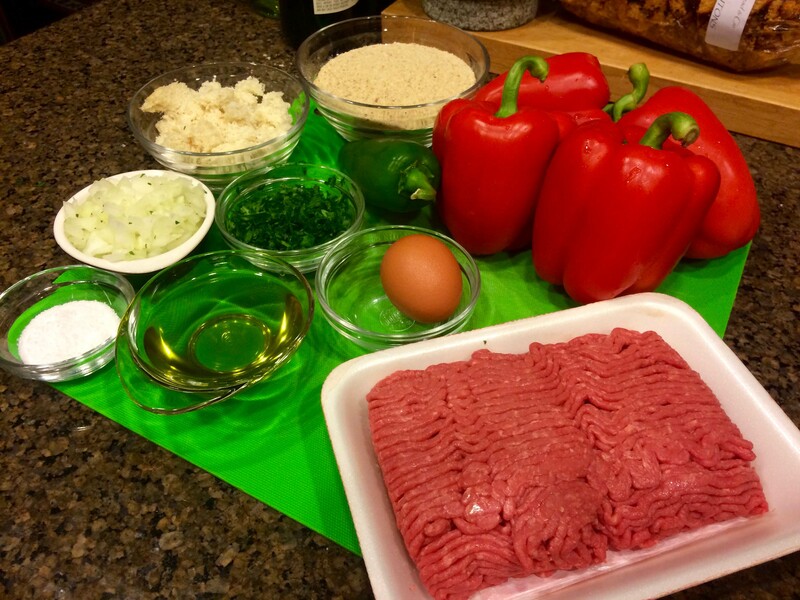 8 – Add the peppers with a little bit of salt, turn the contents of the pan over using a wooden spoon and a light touch, lower the heat, and cover the pan. You have a choice of how long to continue cooking. If you want the peppers to star—that is, if you would like them to maintain enough of their shape to show on the plate—cook them just until a fork slips easily into them, about 10 minutes. If you think that you may enjoy them more as a sauce, and a very tasty sauce it would be, just continue to cook them until they begin to dissolve. 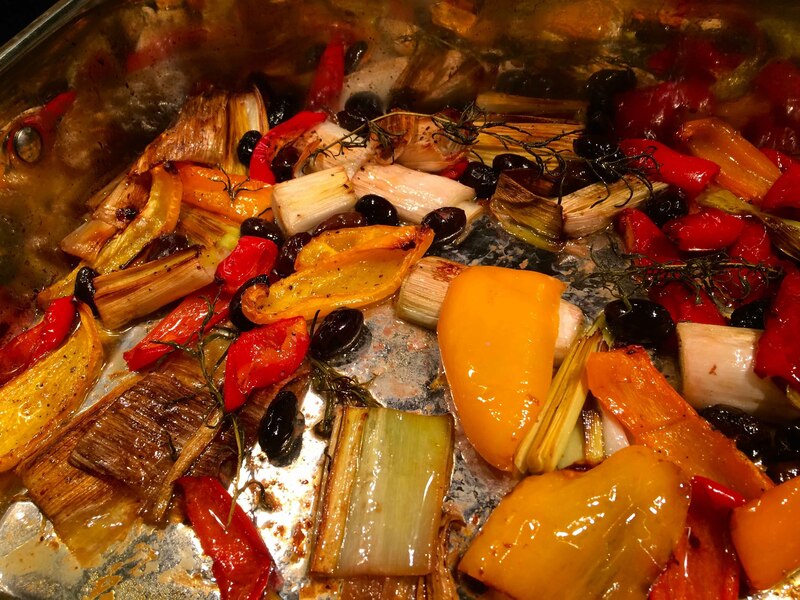 When the peppers are done to taste, transfer the contents of the pan to a warm platter and serve at once. Sometimes I find that it’s the end of the week, and I’ve served nothing but meatcentric meals. More often than not this is due to buying what’s on sale at the market, re-purposing leftovers, or just my hankering for a steak. It’s at times like these that I start to look for a non-meat dish, which usually winds up being pasta or, as my better half bemoans, “all too seldom,” fish. 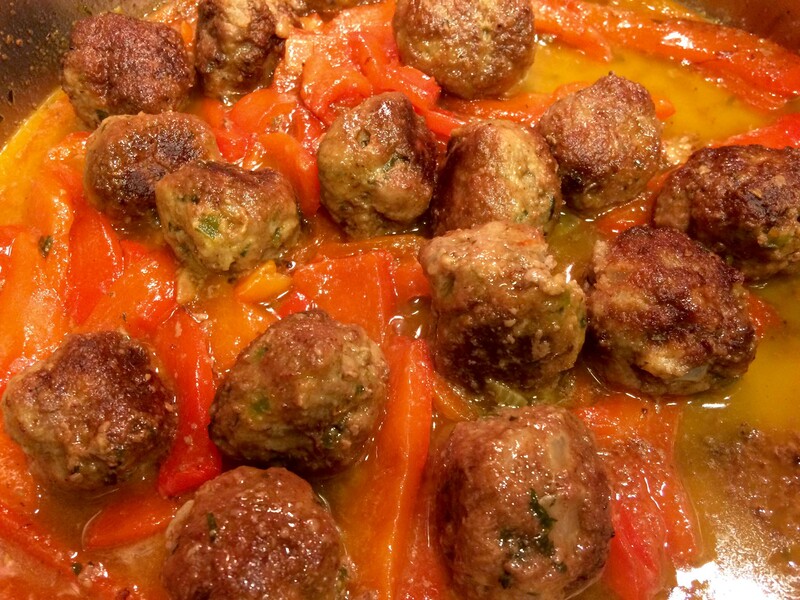 In my search, I came across this recipe from Mario Batali’s cookbook Molto Gusto. Just the word “ragu” made my mouth water. 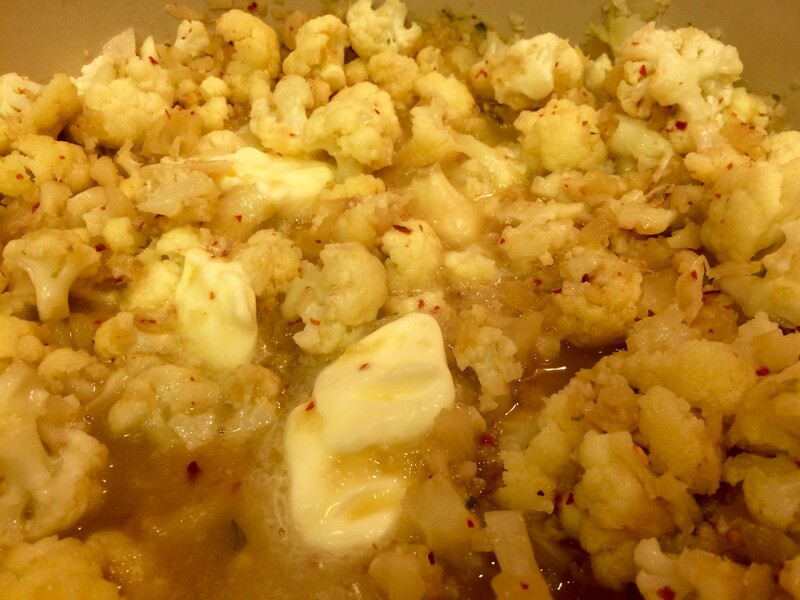 Except for the frequent stirring of the cauliflower, it’s a relatively simple dish to prepare and, as the recipe points out, it can be made days in advance. 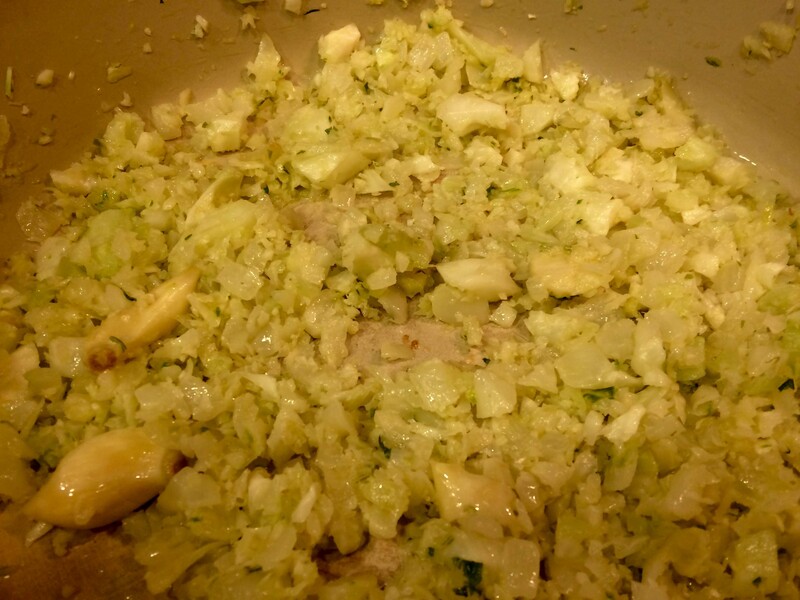 I did find, however, that I needed to extend the three cooking times for the cauliflower, especially at the third stage. 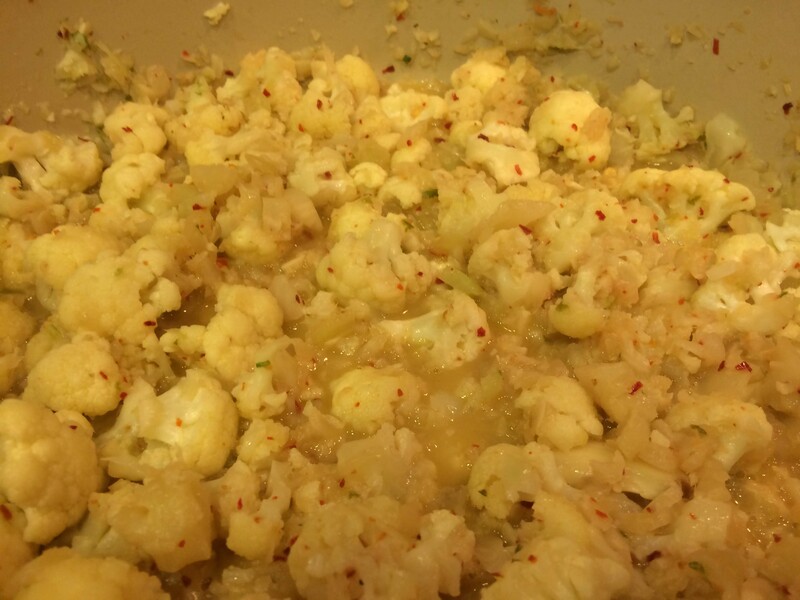 I’ve given the recipe’s original times, but strongly suggest that you taste the cauliflower for tenderness at each stage. 1. 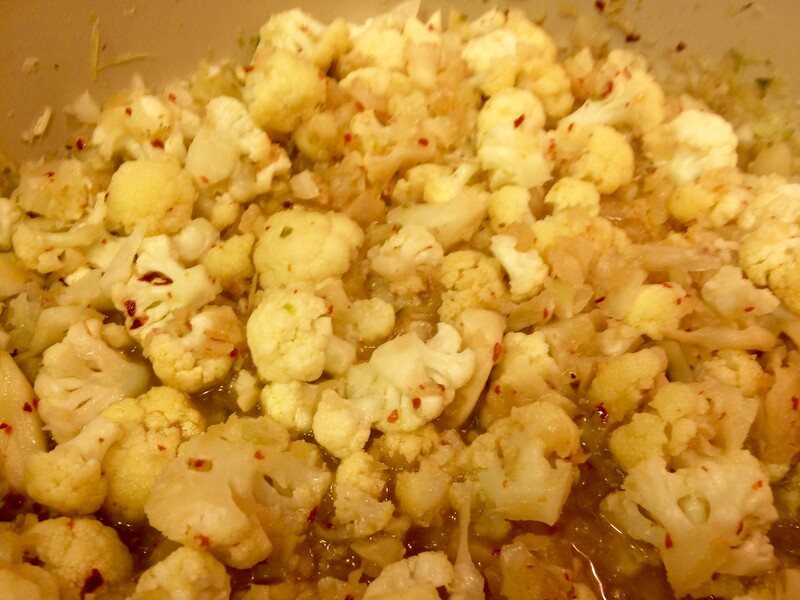 Halve the cauliflower. Cut off the leaves and reserve them. Cut out the core and reserve it. 2. 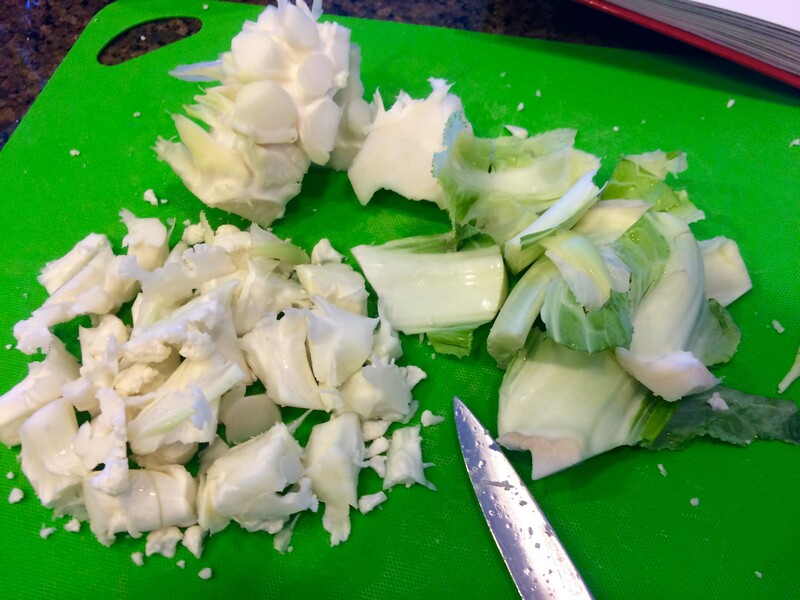 Cut the cauliflower into small bite-sized florets, reserving the stalks. After 3 to 5 minutes of cooking. 7. 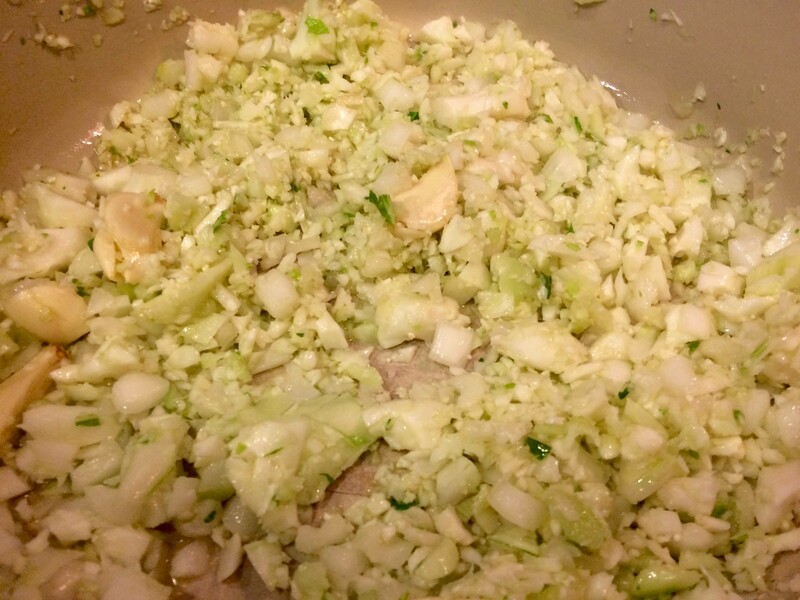 Add the butter, stirring gently until it melts, then season well with Maldon salt and remove from the heat. 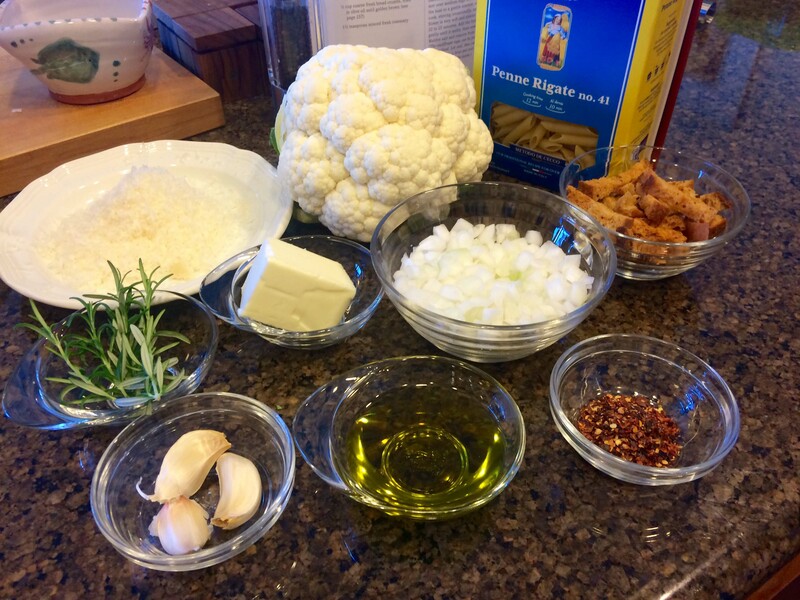 The cauliflower ragú can be prepared up to 3 days ahead. 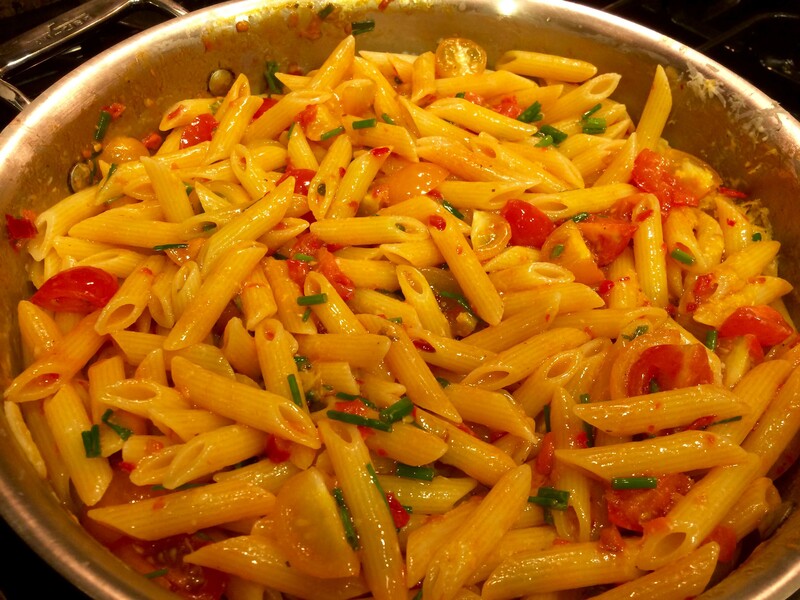 Let cool, then cover and refrigerate; reheat in a large pot over medium-low heat before adding the pasta. 8. Bring 6 quarts water to a boil in a large pot and add 3 tablespoons Kosher salt. 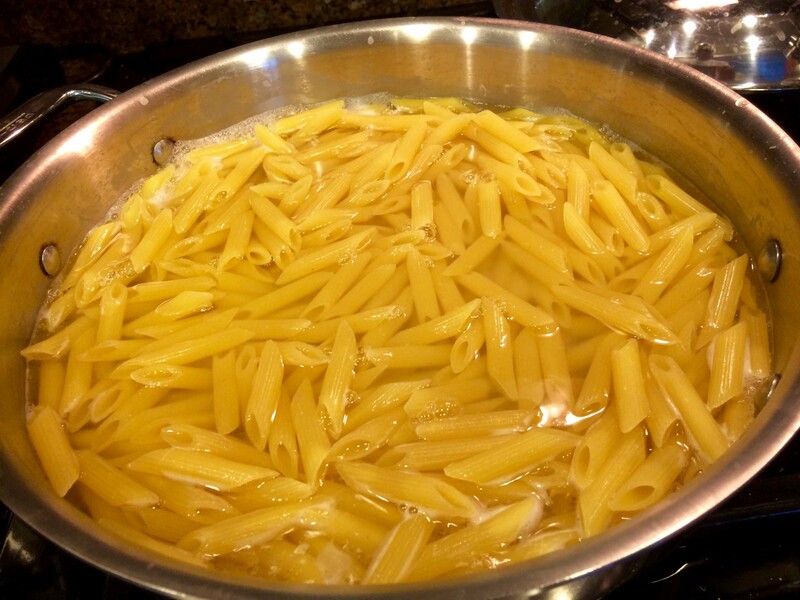 Drop in the pasta and cook until just al dente. 9. 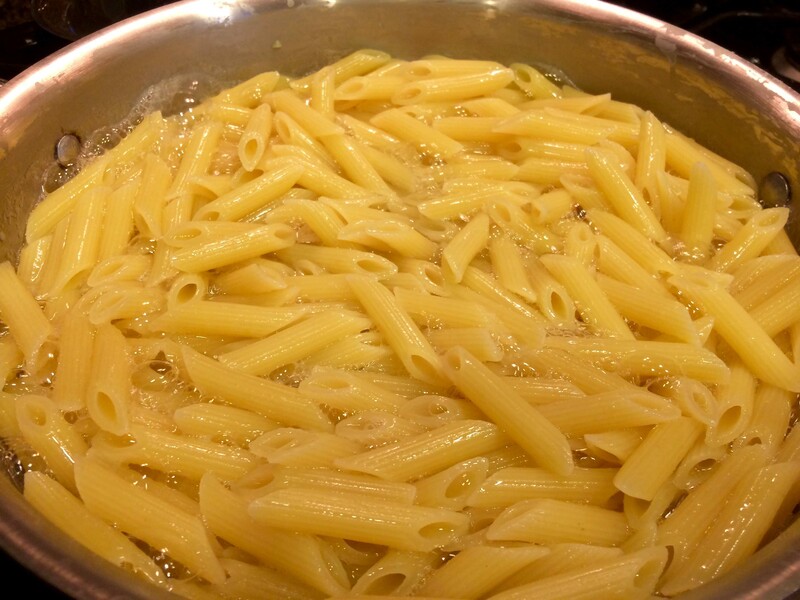 Drain the pasta, reserving about 2/3 cup of the pasta water. 10. 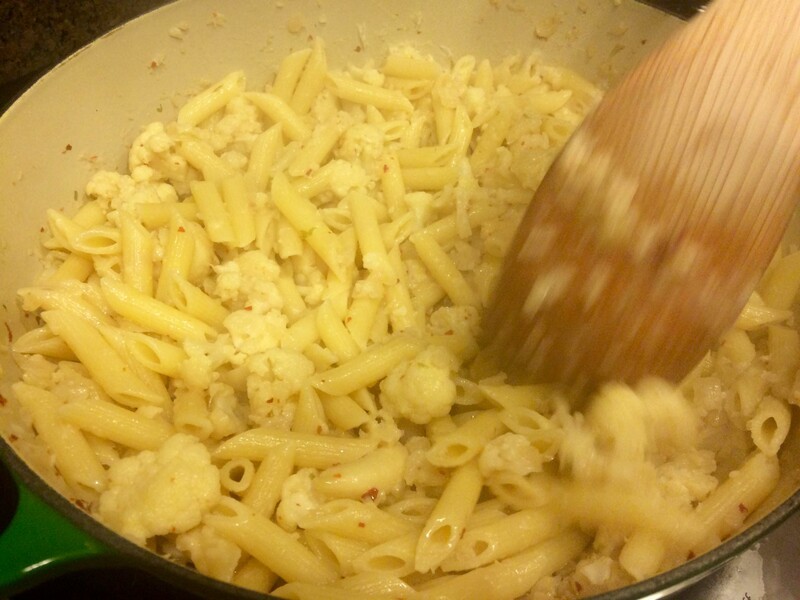 Add the pasta and 1/3 cup of the reserved pasta water to the cauliflower ragú and stir and toss over medium heat until the pasta is well coated (add a splash or two more of the reserved pasta water if necessary to loosen the sauce). 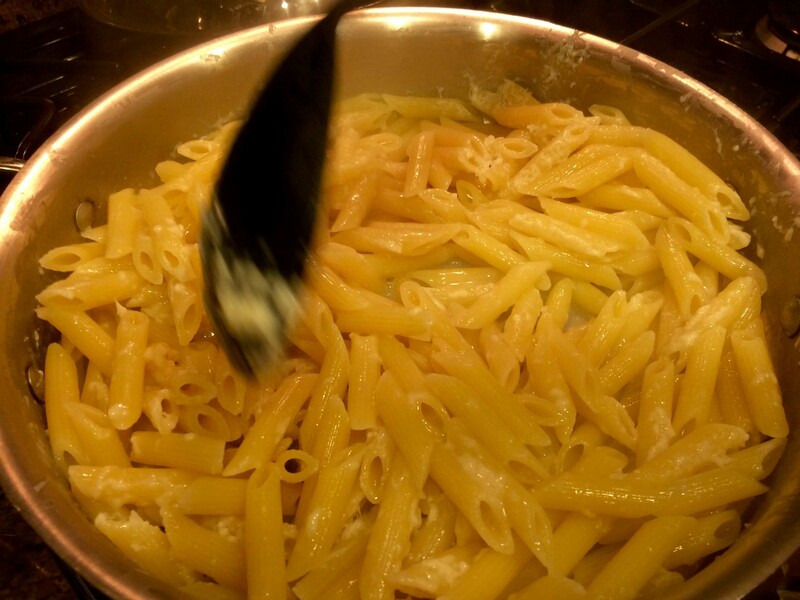 Stir in the cheese. 11. 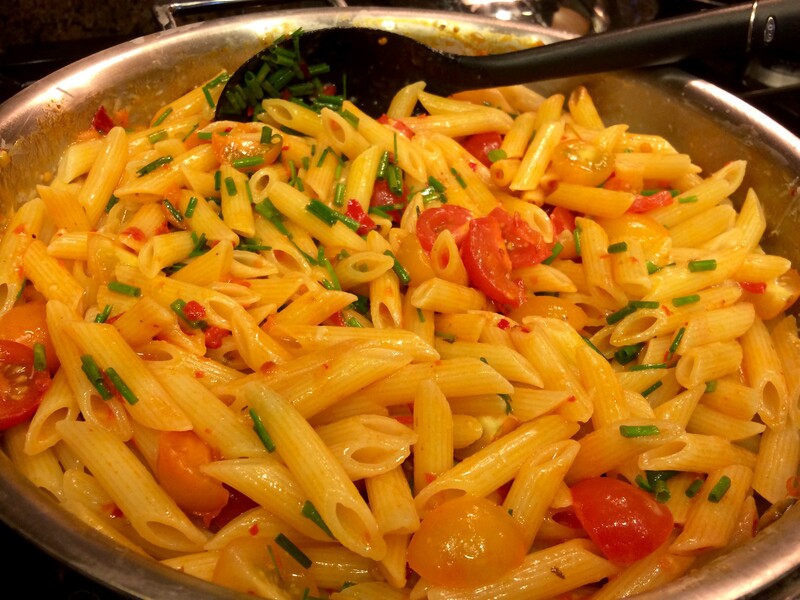 Transfer the pasta to a serving bowl, sprinkle with the bread crumbs and rosemary, and serve, with additional grated cheese on the side. As you can see, I opted for big boy breadcrumbs. There’s something about Nigella Lawson. I can’t put my finger on it, but I can watch her cook for hours, even replaying her shows, and never get bored. Yes, she’s probably the most attractive TV chef around, but she brings more than good looks to the table. As she sashays through her kitchen with a just a hint of insouciance, she describes her dishes so sensuously that your mouth waters. 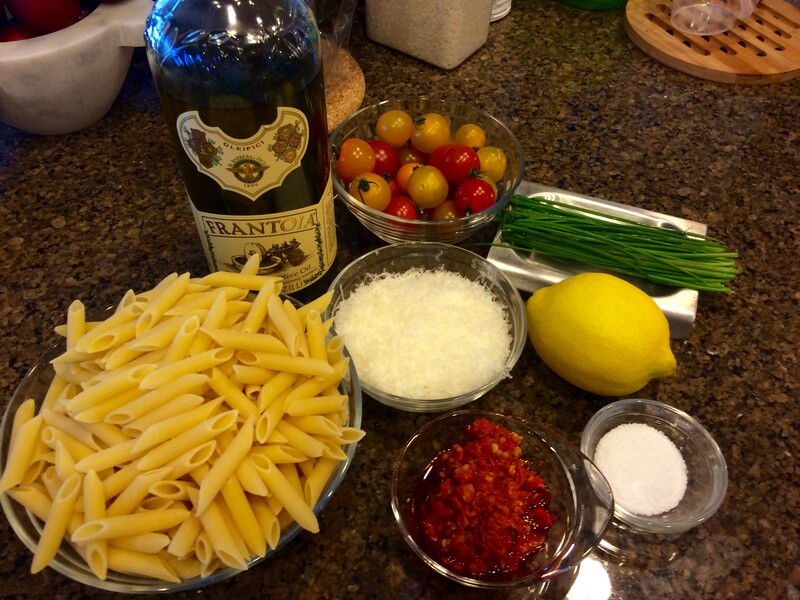 And when she cooks, Italian, well…be still my palate. Most recently, I watched her making an Italian roast chicken with peppers and olives accompanied by a saffron orzotto. 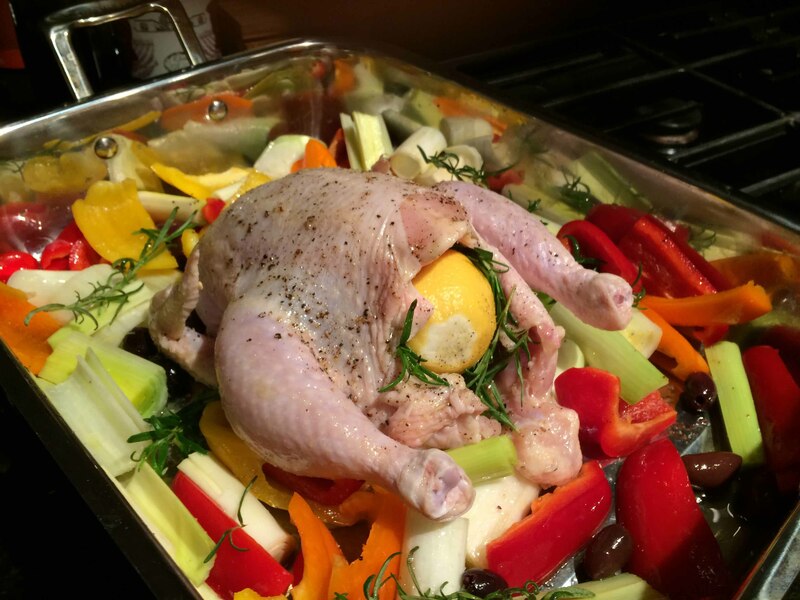 The chicken is cooked untrussed in a roasting pan, stuffed with a half of lemon and rosemary, atop sliced red, yellow, and orange peppers, leeks, and pitted black olives. Everything is drizzled with olive oil and seasoned simply with sea salt and freshly ground black pepper. A few more sprigs of rosemary are tossed in with the sliced vegetables. Because the chicken is untrussed, it cooks rather quickly in a 400°F oven for about an hour or an hour and a quarter. 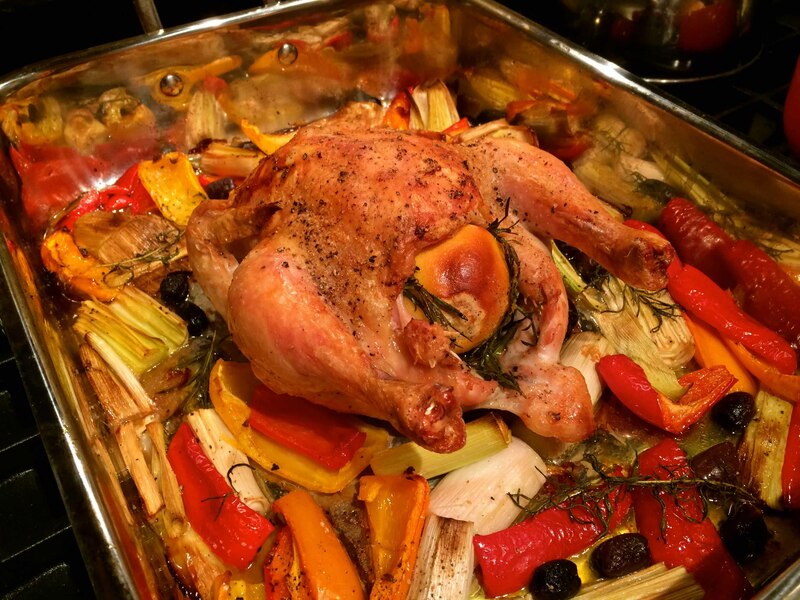 As the chicken, or as Lawson calls it “my burnished bird,” rests, the vegetables continue to roast for another 10 minutes. Lawson accompanies this succulent chicken with a saffron orzotto, an easy alternative to a risotto Milanese. 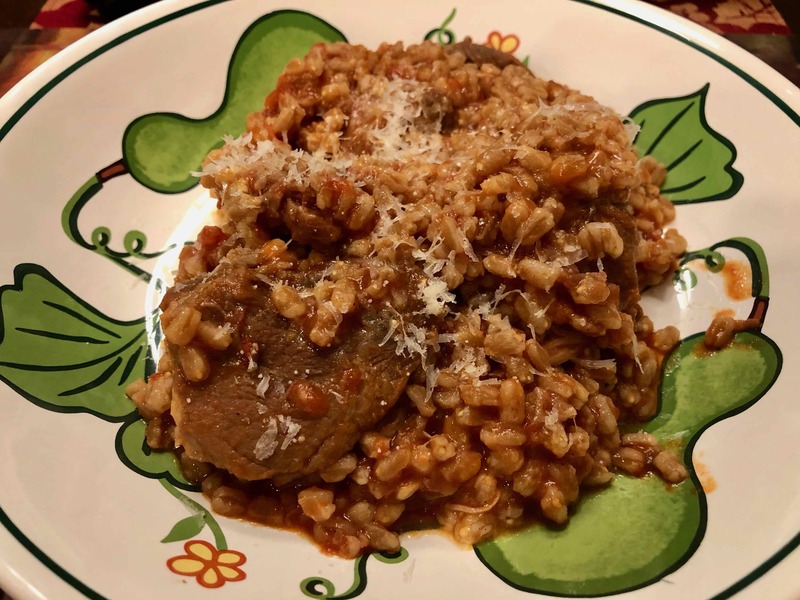 I prepared it for two and used a half cup of pearled barley (orzo in Italian). Heat 1 cup of chicken stock and add about a 1/4 teaspoon of saffron threads. Keep it warm. Finely chop a banana shallot and cook it over medium heat in a couple of tablespoons of olive oil. When the shallot has softened, in about 5 minutes, add the barley, stirring to thoroughly coat the grains with the oil for about 1 minute. Add the stock, cover, reduce the heat to low and simmer for about 30 minutes or until the barley is cooked. 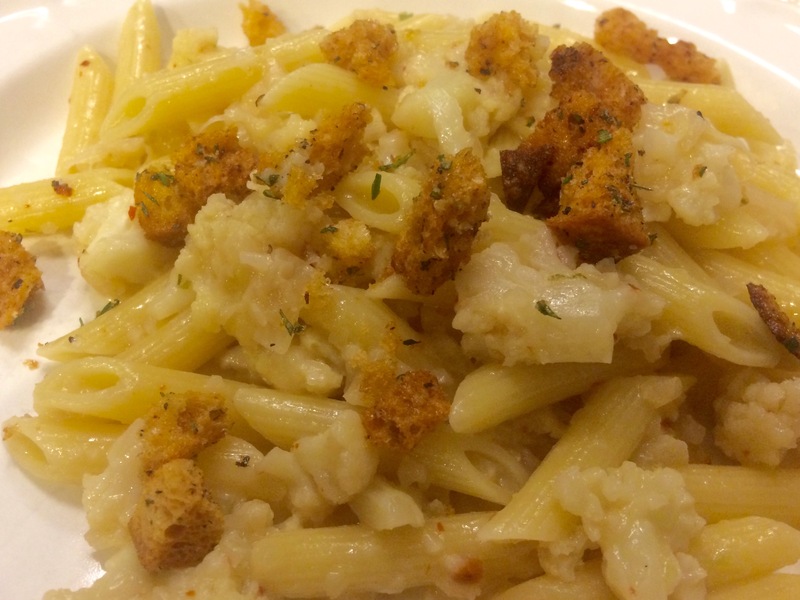 At the end, stir in some freshly grated Parmigiano-Reggiano and serve. There is nothing difficult about this menu. 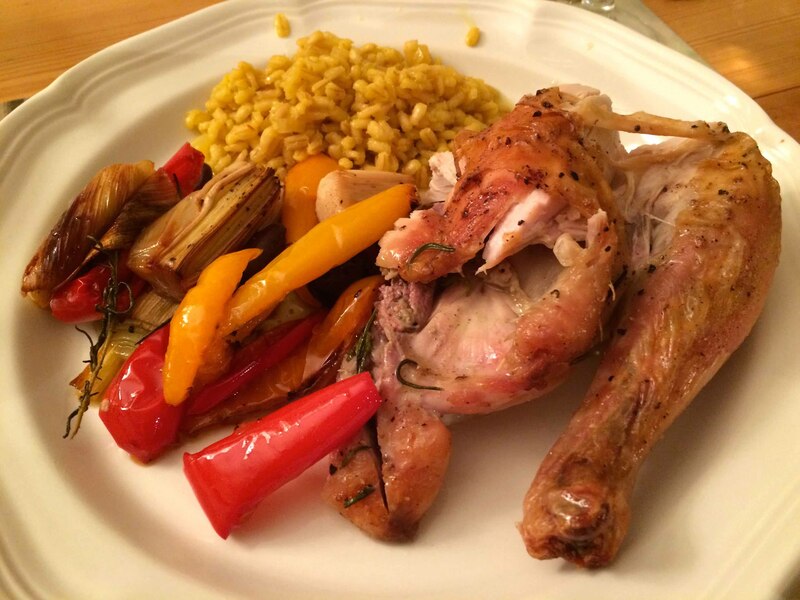 The multicolored vegetables and the golden orzotto alongside the burnished chicken make for a colorful presentation. 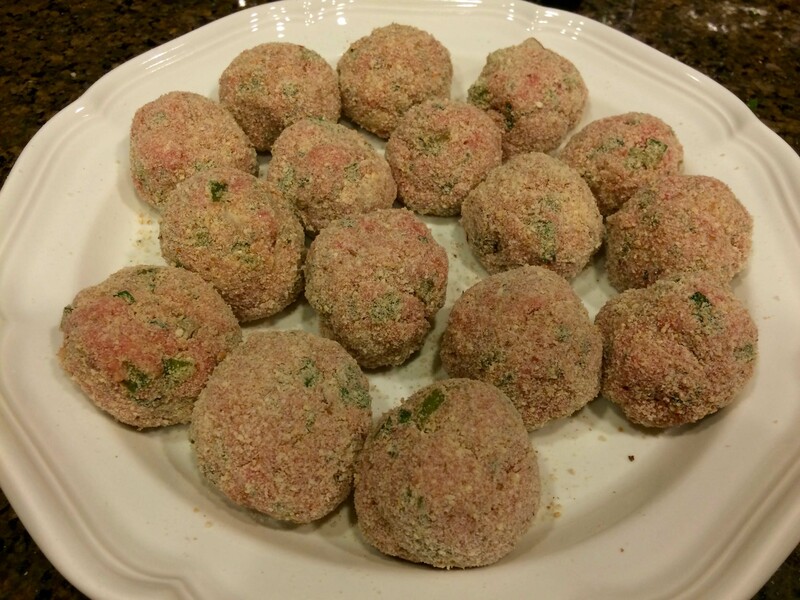 Here’s a link to the original recipe on Lawson’s Website.